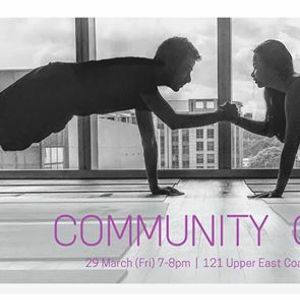 Pair Yoga is a Hatha based practice focused on giving and receiving assistance, deepening the practice of asanas and connecting with others. We will work in pairs for most of the class. Pair yoga poses work mainly by adding resistance and providing assistance. Through practising with another you will improve your ability to communicate, relax, trust and to be focused on the present. This class is suitable for all levels from beginner to advanced. Class is $10, mats are provided. Sign up with a friend/partner, or come and make a friend! Wenlin Tan is a movement and mindfulness practitioner and a Registered Yoga Teacher (RYT) with Yoga Alliance. She organises group and private classes, workshops and retreats, and has worked with preschool children, adults and seniors. Art of Yoga is a boutique yoga studio offering a variety of classes including Hatha Yoga, Ashtanga Yoga, Vinyasa Flow, Yin Yoga and Prenatal Yoga.